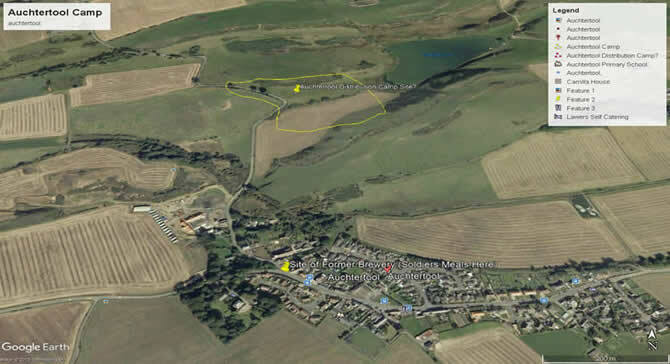 Auchtertool, Fife, Scotland is located on the B925 in Fife, Scotland. I live about 5 miles away from Auchtertool and it's interesting to see the varying names Auchtertool Distribution Camp (Obóz Rozdzielczy W Auchtertool) is referred to under. This is a 1945 reconnaissance photo of the site where the Auchtertool Distribution Camp was located. When i was researching the potential site for the Auchtertool Distribution Camp (Obóz Rozdzielczy W Auchtertool) location, the marks on this piece of ground caught my eye and led to a theory this was the camps location and the marks had been left by temporary structures. Turns out I was right! Note the close proximity to the former brewery where the Polish soldiers were fed. Auchtertool POW camp (Because some believed they were POW's when in fact they were exiles). The reason I am labouring this point about the name of Auchtertool Distribution Camp is that when you start to do extensive research you need to understand that this camp was known by many names and knowing these names helps you identify the camp. I have seen Auchtertool Distribution Camp referred to as being "outside Dunfermline", "outside Kirkcaldy" and quite possibly it could be known as being "outside Cowdenbeath". The truth is it is almost an equal distance from all 3 towns. I guess it depends the route you took to get there as to which town you describe it as being near. To see Auchtertool, Fife, Scotland on the map click here: Auchtertool. Further, I believe its official function to have been known as a "distribution camp" but I have also seen "reinforcements camp", "camp for soldiers from the USSR", "military staging camp", "re-assignment camp", and "holding camp". Some even mistakenly refer to Auchtertool Distribution Camp as a "POW Camp". I suppose it was known by many names depending on the aspect in which you were speaking about it (but certainly it was never a POW camp). The variety of terms make it even harder to track down information on it. The Auchtertool Distribution Camp (Obóz Rozdzielczy W Auchtertool) itself was in mutiple locations. One part was in "the former brewery", the other part(s) in a couple of fields about 1/2 a mile away on the Auchtertool to Lochgelly road. Living very close to the locale myself, I visited the field where the camp site(s) used to exist. It is the most unlikely place ever for a sizeable army camp to be setup. Situated between two very steep hillocks it would have been a quagmire in a rainfall and to situate so many men in such a close space would have resulted in overcrowding. Poles In The Local Pubs! One thing that made me smile though was that Auchtertool had a population of around 400. When thousands of Polish troops descended, the 6 public houses that were there must have been well subscribed to! This is the same geo-location as the above photo but in 2006. Some drone video footage from 2016. The ground where the Polish camp was aka Auchtertool Distribution Camp was based in 1942 is clearly visible several times. In the opening first few seconds, on the lower RHS is a red roofed building with a conical roof. This is the only original building left that was part of the Brewery (Polish Soldiers HQ). The surrounding buildings on that side of the road are all former brewery ground. At 7:02 these same buildings and entire brewery grounds are exclusively in the LHS of the video. The large house surrounded by trees is the (alleged) place where Sikorski stayed when up visiting the Auchtertool camp. Exciting Aerial Footage Of Auchtertool Distribution Camp! This footage is some of the best I have seen. 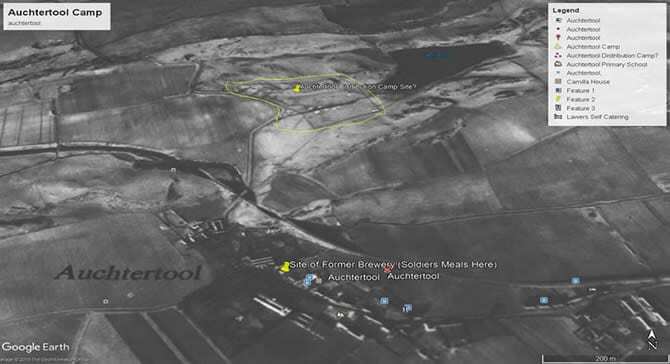 It covers Auchtertool and surrounding area, but the drone does a DIRECT FLYOVER of the very field that served as the Polish Camp at Auchtertool in Fife. At 7:28 Camilla Loch in view. The dark green field (where the road bends) is the very field the Polish soldiers camped in. The light green field immediately to the right of it was a makeshift football field where the troops played football. On the LHS is a tree line beside a very little river.